UNDER CONTRACT! 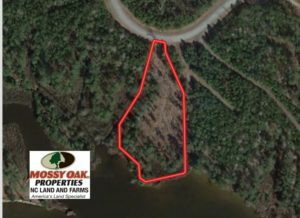 300 ac Riverfront Development Land for Sale in Bertie County NC! 300 ac Riverfront Development Land for Sale in Bertie County NC! High bluffs overlooking the Chowan River, over 1/2 a mile of shoreline, pre-approved for development. 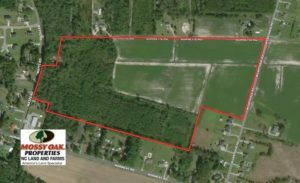 Located just 15 minutes from Lumberton and borders the Lumber River State Park, this conveniently located property would make a great hunting retreat or an ideal timber investment! 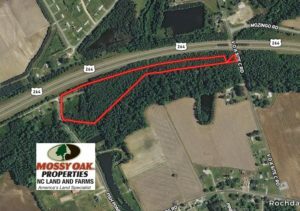 +/- 14 Acres of Residential Development Land For Sale in New Hanover County NC! UNDER CONTRACT! 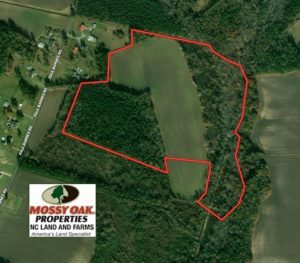 541.7 Acres of Farm and Hunting Land with Home For Sale in Columbus County NC! 290.75 Acres of Creek Front Hunting and Timber Land For Sale in Pender County NC! With more than 4 miles of creek front property, this conveniently located, heavily treed tract would make the ideal outdoor retreat or a gorgeous place to build a dream home! 78 Acres of Timber and Development Land for Sale in Henderson County NC! 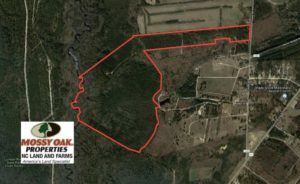 366 Acres of Development Property for Sale in Craven County NC! 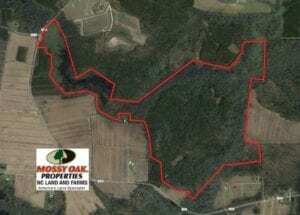 132 Acres of Hunting, Fishing, and Residential Land For Sale in Lenoir County NC! 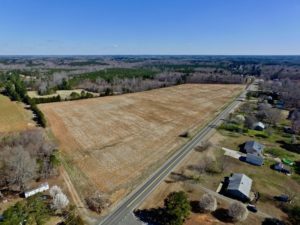 56 Acres of Farm and Residential Development Land For Sale in Washington County NC! 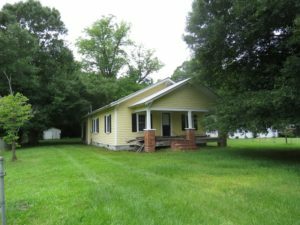 126 Acres of Farm and Timber Land With 2 Remodeled Homes For Sale in Person County NC! UNDER CONTRACT! 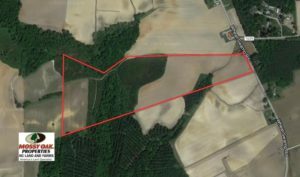 280 Acres of Developable Farm and Timber Land For Sale in Granville County NC! 107.44 Acres of Investment and Developmental Land For Sale in Cherokee County NC! 0.66 Acres of Waterfront Residential Land with Home For Sale in Northampton County NC! 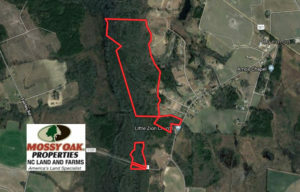 299 Acre Farm and Timberland For Sale in Craven County NC! UNDER CONTRACT! 37.78 Acres of Farm Land with Residence for Sale in Columbus County NC! The Dillon's Ridge Farm is for sale! Income producing farmland and timberland, hunting, as well as, sand mining and development opportunities all within 35 minutes of the Outer Banks. This gorgeous piece of farmland is ready for a set of building plans, a fresh crop, a couple of buck tags and a fishing pole! UNDER CONTRACT! 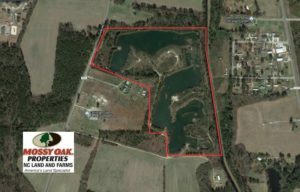 270.86 Acres of Pasture and Timber Land with Pond For Sale in Halifax County NC! 187 Acres of valuable Timber Land packed with wildlife providing wonderful Turkey, Deer and Small Game Hunting. 7.62 Acres of Farm Land And Turkey Operation For Sale In Greene County NC! 175 Acres of River Front Hunting Land For Sale in Bladen County NC! 175 Acres of Pristine Bladen County Timberland with rolling terrain along Cape Fear River. A true hunter's paradise! With creek front property, good soils, and great timber, this tract makes an excellent timber investment or hunting retreat full of opportunities! 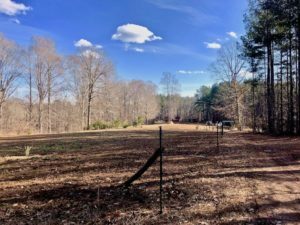 70 Acres of Pasture and Timber Land with Home For Sale in Alamance County NC! UNDER CONTRACT! 356.33 Acres of Hunting and Timber Land For Sale in Pamlico County NC! 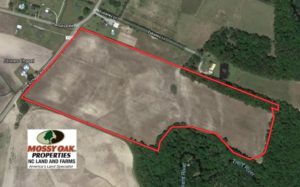 119 Acres of Farm and Timber Land For Sale in Hoke County NC! With a combination of income producing crop land, and growing timber, this farm offers multiple income opportunities! 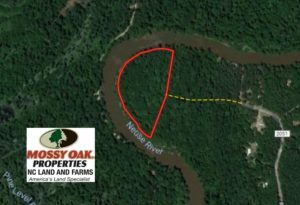 998 Acres of Riverfront Hunting Land For Sale in Camden County NC! With mature pine timber, quality agricultural soils, and great hunting, this a premium farm located close to the beaches! With some of the best black bear populations in the world, deer, turkey, and small game, a buildable lot and waterfront amenities, this property is a sportsmans paradise! 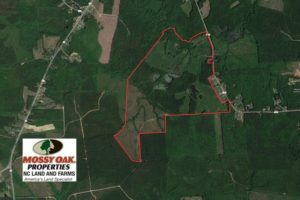 482 Acres of Hunting Land For Sale in Columbus County NC! UNDER CONTRACT! 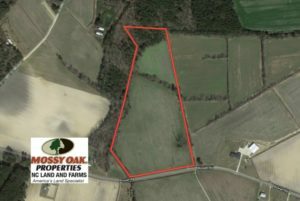 111 Acres of Pasture and Timber Land with 2 Homes For Sale in Caswell County NC! 250 Acres of Prime Bear Hunting Land and Lodge For Sale in Washington County NC! A beautiful lake front lot in a small quiet town would make the perfect place for a dream home on the water! This property would make a great farm investment with plenty of tillable soil, or a hunting retreat ready for the perfect food plot! 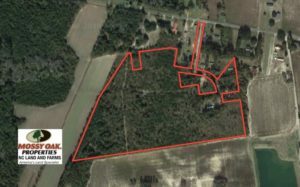 39 Acres of Farm and Timber Land with Home For Sale in Columbus County NC! UNDER CONTRACT! 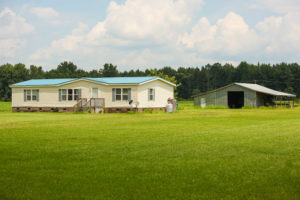 118 Acre Livestock Farming Operation for Sale in Nash County NC! 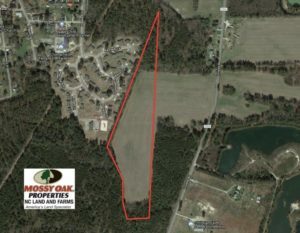 61.04 acres of Farm Hunting and Residential Land For Sale in Columbus County NC! 81.75 Acres of Farm and Timber Land For Sale in Wilson County NC! Incredible deal on commercial property right in the heart of Roanoke Rapids' major business area! Ideal location for your business to grow and thrive! With an equal mixture of open agriculture and mature timberland, this 86-acre property is the perfect choice with endless earning potential! UNDER CONTRACT! 189.85 Acres of Timber and Hunting Land For Sale in Pamlico County NC! This 189.85 acre Tract provides a substantial timber investment along with great hunting opportunities! Additional Acreage available for purchase along with off site home site with water and sewer! 112 Acres of Farm and Recreational Land For Sale in Robeson County NC! Featuring a beautiful 12+/- acre lake, crop land, timber land, and great hunting and fishing, this farm offers multiple opportunities for recreation and income! 50.8 Acres of Timber and Pasture Land For Sale in Cleveland County NC! 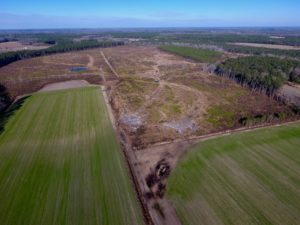 204 Acres of Hunting and Timberland for Sale in Duplin County NC! With great hunting opportunities, this secluded tract is a great timber and recreational tract! 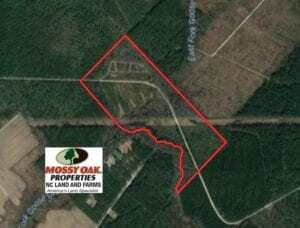 37.36 Acres of Hunting and Timber Land with House For Sale in Columbus County NC! With a nice home and plenty of acres for hunting and children to play, this would make the perfect place to raise a family in the country! 62 Acres of Farm and Hunting Land For Sale in Scotland County NC! With great agricultural soil types and plenty of wildlife, this is a premium farm located close to town! 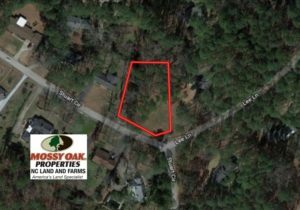 10 Acres of Multipurpose Land on Lake Gaston's Most Traveled Road! Business, Residential, or Developmental use waiting for you less than a half mile from the Lake Gaston Hub! UNDER CONTRACT! 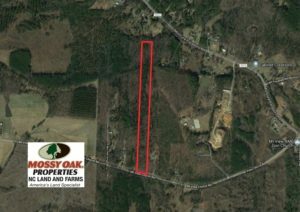 69 Acres of Residential Timber and Farm Land for Sale in Columbus County NC! With a home site ready to build, farmland, timber, and even a 13-acre pond, this property offers it all! 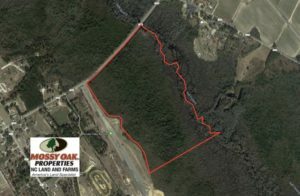 62.41 Acres of Residential and Timber Land For Sale in Cumberland County NC! With great soils and a perfect location, this tract offers plenty of possibilities! 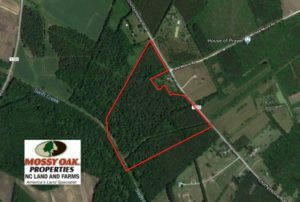 73 Acres of Farm and Timber Land For Sale in Robeson County NC! With quality agricultural soils and development potential, this farm is a great investment! 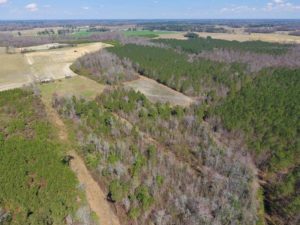 97 Acres of Farm and Timber Land For Sale in Columbus County NC! With great agricultural and timber soils, this income-producing farm is a great investment that also offers excellent hunting! 59.14 Acres of Farm and Hunting Land For Sale in Columbus County NC! UNDER CONTRACT! 56.69 Acres of Farm and Timber Land For Sale in Wilson County NC! 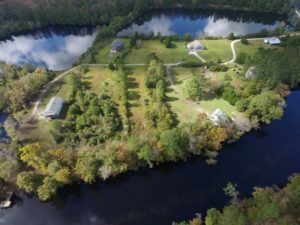 With longleaf and loblolly pine timber, income from pine straw, home sites, and frontage on the Lumber River, this diverse property is a great investment that also offers recreational opportunities! UNDER CONTRACT! 19.49 Acres of Residential Farm Land with House For Sale in Bladen County NC! 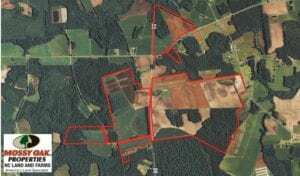 89 Acres of Timber and Farm Land For Sale in Hoke County NC! 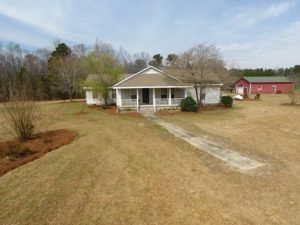 With longleaf and loblolly pine timber, income from pine straw, agricultural fields, and home sites, this farm is a great investment that also offers recreational opportunities! 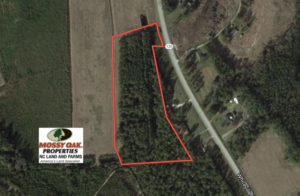 With 73 acres of timberland located on the Waccamaw River and existing trails within the property, this tract would be any sportsman's paradise! 23.23 Acres of Residential Land For Sale in Lee County NC! UNDER CONTRACT! 44 Acres of Farm and Timber Land For Sale in Franklin County NC! 47 Acres of Farm and Hunting Land For Sale in Columbus County NC! UNDER CONTRACT! 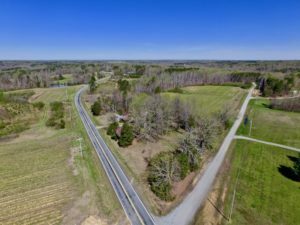 8 Acres of Residential Equine and Farm Land For Sale in Richmond County NC! 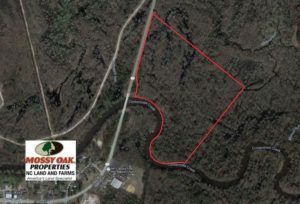 29.25 acres of Residential Hunting and Timber Land For Sale in Columbus County NC! 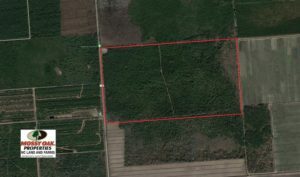 55.85 Acres of Farm and Timber Land For Sale in Columbus County NC! With 20 acres of farmland, 32 acres of timberland, a great home site, and even a small pond, this conveniently located property has endless possibilities! REDUCED! 101 Acres of Hunting Land For Sale in Cumberland County NC! With a two-acre duck impoundment, extensive frontage on the South River, great game populations, and a very nice camp, this tract is a premium hunting property. 113 Acres of Timber and Farm Land For Sale in Hoke County NC! 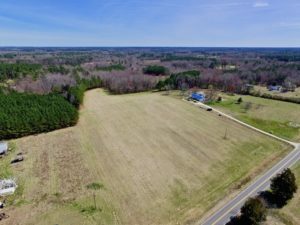 With longleaf and loblolly pine timber, agricultural fields and home sites, this farm is a great investment that also offers recreational opportunities! UNDER CONTRACT! 32.7 Acres of Timber and Pasture Land For Sale in Cleveland County NC! 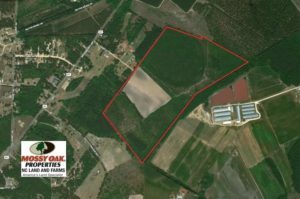 45.89 Acres of Farm and Timber Land For Sale in Columbus County NC! With a potential home site, land to hunt, a creek to fish, timberland, and farm land, this conveniently located property offers plenty of options to enjoy the outdoors all year! 42 +/- Acres of Pasture and Timber Land Ready for Your Dream Home, Hunting and Equestrian Site. This conveniently located property would make the perfect country home! UNDER CONTRACT! 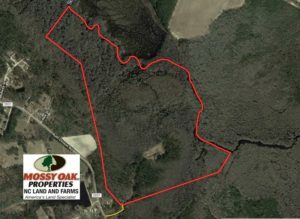 59 Acres of Hunting and Development Land for Sale in Person County NC! UNDER CONTRACT! 14.76 Acres of Farm Land With Shop Buildings For Sale in Columbus County NC! With two very nice metal shop buildings and plenty of room for expansion, this property would be great for a farm shop, car repair, or welding shop! UNDER CONTRACT! 75.9 Acres of Timber and Hunting Land For Sale in Pamlico County NC! This 75.9 Acre timber tract offers great hunting opportunities! Additional Acreage available for purchase along with off site home site with water and sewer! UNDER CONTRACT! 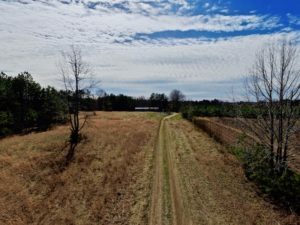 43 Acres of Farm and Timber Land For Sale in Wilson County NC! Featuring rolling farmland, flooded timber for waterfowl hunting, and fantastic deer and turkey hunting! This tract is perfect for your dream home or hunting cabin. Easily accessible, yet secluded! Approximately 4 Acres of Land with Your Dream Home, a Pond, and Equestrian Site. UNDER CONTRACT! 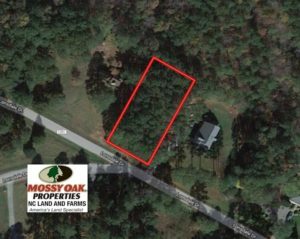 10 Acres of Hunting Land with House For Sale in Granville County NC! Ready to move your business to the thriving Lake Gaston Market? Prime location at a super affordable price! Functional office building and warehouse-shop to meet all your business needs! UNDER CONTRACT! 47 Acres of Timber and Hunting Land For Sale in Pitt County NC! With 28. 14 acres of timberland located on the Waccamaw River and existing trails within the property, this tract would be any sportsman's paradise! REDUCED! 71 Acres of Timber Land For Sale in Bladen County NC! 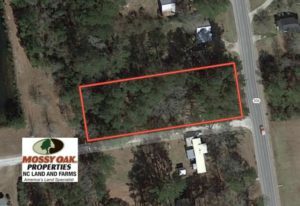 With a nice duck swamp and an opportunity to plant long leaf pine timber for future income, this is an affordable hunting and timber tract in a very nice area! 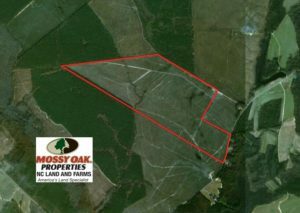 71 Acres of Farm and Timber Land For Sale in Scotland County NC! 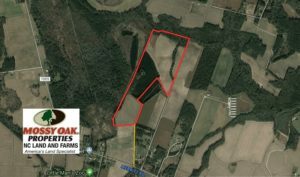 50 Acres of Farm and Timber Land For Sale in Robeson County NC! With income producing crop land and timber land, and a pond full of fish, this farm is a great investment! 18.5 Acres Farm Land For Sale in Hyde County NC! Located just outside of the Town of Wilson, this property is easily accessible! Its full of wildlife and would make an affordable hunting camp. 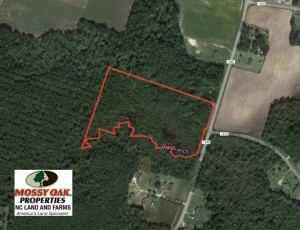 16.3 Acres of Farm and Timber Land For Sale in Pamlico County NC! 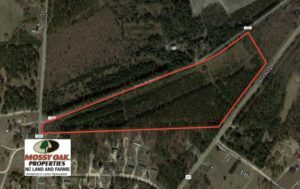 3 Acres of Commercial Land for Sale in Columbus County NC! With great road frontage, 2 driveways, and an existing commercial building, this conveniently located property is sure to suit your business needs! 134 Acres of Hunting Land For Sale in Columbus County NC! UNDER CONTRACT! 15 Acres of Residential Land For Sale in Chatham County NC! UNDER CONTRACT! 30 Acres of Hunting and Timber Land For Sale in Warren County NC! Looking for your own private hunting and timberland property? This property offers privacy, ample wild game, and timber investment without breaking the bank! UNDER CONTRACT! 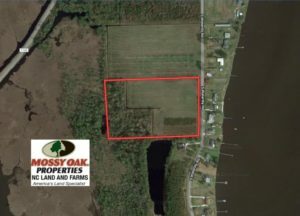 1.24 Acre Waterfront Lot For Sale on the Bay River in Pamlico County NC! Outstanding views on this affordable waterfront lot located on the Bay River with excellent boating, fishing, and hunting opportunities and deep-water access. UNDER CONTRACT! 55.92 Acres of Timber and Hunting Land For Sale in Pamlico County NC! 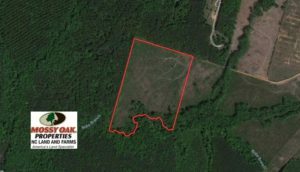 This 55.92 acre timber tract offers great hunting opportunities! Additional Acreage available for purchase along with off site home site with water and sewer! 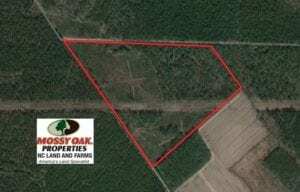 45 Acres of Hunting and Timber Land For Sale in Columbus County NC! This tract is perfect for a small timber investment or hunting! UNDER CONTRACT! 0.20 Acre Residential Lot with Cabin For Sale in Halifax County NC! 13.7 Acres of Farm Land For Sale in Pamlico County NC! 11.9 Acres in Lee County, NC ready to build! Just 15 minutes from Sanford, and 30 miles to Raleigh. Desirable location! Close proximity to Chatham Park. Additional Acreage Available! 26 Acres of Residential Farm and Hunting Land for Sale in Robeson County NC! This conveniently located tract has 18 acres of cleared land and 8 acres of cut over timberland making this a great country getaway with numerous possibilities! UNDER CONTRACT! 12.52 Acres of Recreational Hunting Land For Sale in Nash County NC! 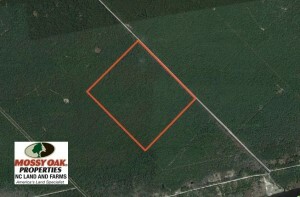 34.88 Acres of Timber and Hunting Land For Sale in Columbus County NC! This tract offers 34.88 acres of timber investment property plus Whitetail deer and turkey hunting opportunities. 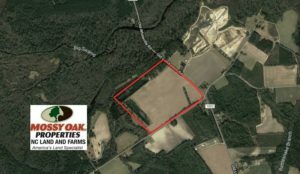 47 Acres of Farm and Timber Land For Sale in Columbus County NC! With quality agricultural soils and growing timber, this is an income producing farm that also offers great hunting! 8.5 Acres of Recreational Land with Barn and Pond For Sale in Hyde County NC! 19 +/- Acres of Pasture and Timber Land Ready for Your Dream Home, Hunting and Equestrian Site. UNDER CONTRACT! 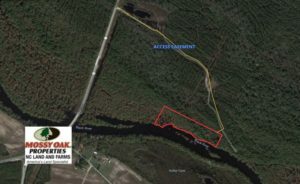 23 Acres of Hunting Land For Sale in Brunswick County NC! With a private potential home site and great hunting, this property is close to everything but still in the country! 11.33 Acres in Lee County, NC ready to build! Just 15 minutes from Sanford, and 30 miles to Raleigh. Desirable location! Close proximity to Chatham Park. Additional Acreage Available! 6.06 Acres of prime Commercial property with 100 feet of Road Frontage on Lake Gaston's Most Traveled Road! 17.6 Acres of Farm Land For Sale in Columbus County NC! UNDER CONTRACT! 46 Acres of Recreational Land For Sale in Robeson County NC! With a beautiful crystal clear lake and waterfront home site, this property is waiting for your dream home! UNDER CONTRACT! 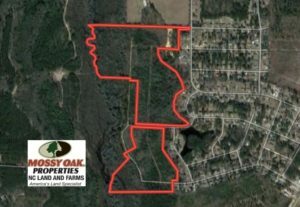 10 Acres of Timber and Development Land For Sale in Brunswick County NC! 86 Acres of Hunting Land For Sale in Scotland County NC! 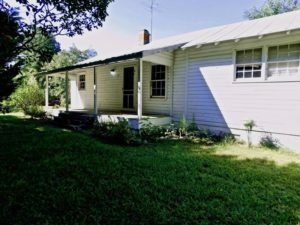 With plenty of wildlife, this is an affordable hunting property located close to town! With three fields that are perfect for food plots and great bedding cover, this is a great hunting farm that also offers home sites! 14.7 Acres of Farm and Residential Land For Sale in Craven County NC! UNDER CONTRACT! 16.44 Acres of Investment Land For Sale in Wilson County NC! 23 Acres of Farm and Hunting Land for Sale in Robeson County NC! With 18 acres of farmland and 5 acres of timberland, this conveniently located property offers many possibilities! 0.78 acres of Waterview Land For Sale in Bertie County NC! UNDER CONTRACT! 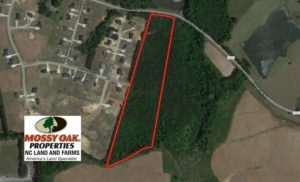 26.89 Acres of Residential and Timber Land For Sale in Edgecombe County NC! UNDER CONTRACT! 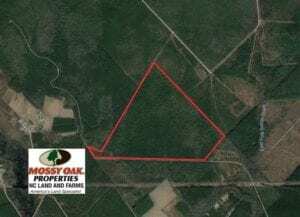 30.6 Acres of Hunting and Timber Land For Sale in Columbus County NC! 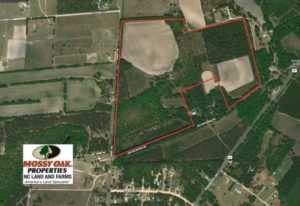 In an area known for hunting, this tract would make a great place for a dream home in the country with hunting in your backyard! 1.25 Acres of Commercial Land For Sale in Wilson County NC! 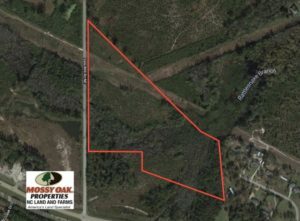 Prime commercial lot located in the heart of Lucama on Highway 301. 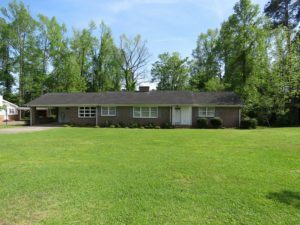 Just minutes from the City of Wilson and Kenly, this property has plenty of potential uses. 0.74 Acres with House and Separate Lot For Sale in Columbus County NC! With one existing house and a second lot ready for a new home, this would make the perfect investment opportunity! 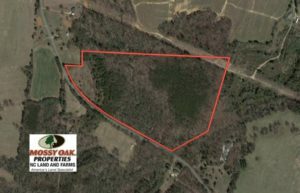 60 Acres of Hunting Land For Sale in Hyde County NC! 60 Acres of Secluded Hunting Land for Sale in Western Hyde County, offering Great Bear and Deer Hunting Opportunities. UNDER CONTRACT! 70 Acres of Hunting Land For Sale in Robeson County NC! With bottomland hardwoods along Raft Swamp, this is a great hunting tract at a very affordable price! Great lot at a great price! Already cleared and ready for development! With the neighboring lots also available for sale, you've got endless possibilities for this great location! UNDER CONTRACT! 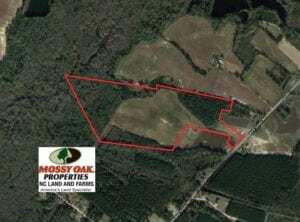 26.5 Acres of Farm and Timber Land for Sale in Columbus County NC! UNDER CONTRACT! 34 Acres of Timber and Hunting Land For Sale in Pamlico County NC! This 34 acre timber tract offers great hunting opportunities! Additional Acreage available for purchase along with off site home site with water and sewer! 0.46 Acres Residential Lot For Sale in Columbus County NC! This lot offers access to the perfect pier for watching the beautiful renowned sunsets over Lake Waccamaw! 23.12 Acres of Timber and Hunting Land For Sale in Wilson County NC! UNDER CONTRACT! 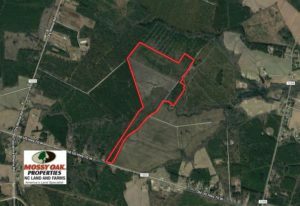 43 Acres of Hunting and Timber Land For Sale in Columbus County NC! With a small pond, a cleared field, and good cover, this hunting tract has everything wildlife needs at a very economical price! 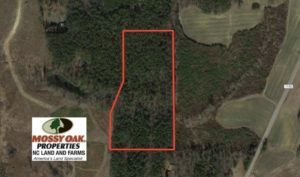 43 Acres of Hunting and Timber Land For Sale in Columbus County NC! With 43 acres of timberland, this would make a great manageable recreation and hunting tract. 10 +/- Acres of Pasture and Timber Land Ready for Your Dream Home, Hunting and Equestrian Site. This conveniently located lot would make an excellent weekend fishing retreat! 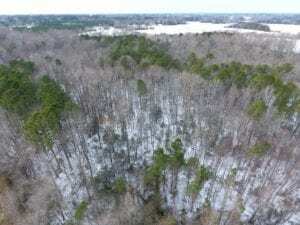 28.8 Acres of Residential Hunting and Timber Land for Sale in Robeson County NC! With a convenient location, potential timber investment, and an ideal hunting tract, this property would make the perfect place to build your dream home in the country! UNDER CONTRACT! 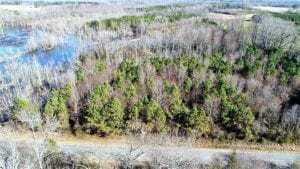 13.81 Acres of Timber, Residential and Recreational Land For Sale in Richmond County NC! 11 Acres of Farm and Hunting Land For Sale in Scotland County NC! With great agricultural soil types and plenty of wildlife, this is a premium small farm located close to town that is perfect for a home in the country! 0.72 Acres of Hunting and Timber Land for Sale in Pender County NC! With a great riverfront view, cabin site, and deeded access to a nearby boat ramp, this would make the perfect getaway for the avid outdoorsmen! 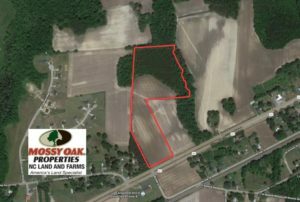 18 Acres of Farm and Timber Land For Sale in Robeson County NC! With quality agricultural soils and a location close to town, this farm is a great investment! With 23. 15 acres of timberland and existing trails within the property, this tract would be any sportsman's paradise! 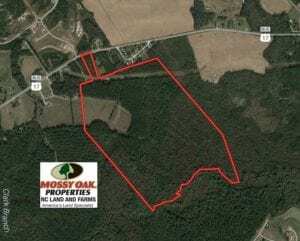 12.4 Acres of Hunting and Timber Land For Sale in Robeson County NC! This conveniently located small, manageable tract would make the perfect outdoor retreat! 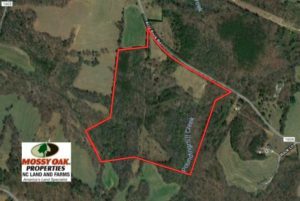 45 Acres of Hunting Land for Sale in Tyrrell County NC! UNDER CONTRACT! 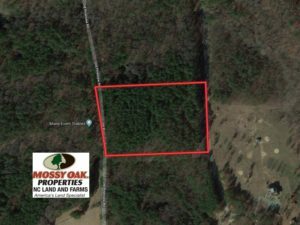 25 Acres of Timber Land For Sale in Hoke County NC! 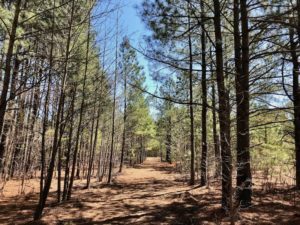 With longleaf pine timber, and home sites this property is a great investment that also offers residential and hunting opportunities! UNDER CONTRACT! 45 Acres of Hunting Land For Sale in Hertford County NC! Secluded, private, and affordable! This property is packed full of wildlife! Surrounded by hundreds of acres of timberland, this is your ticket to hunt big without breaking the bank! UNDER CONTRACT! 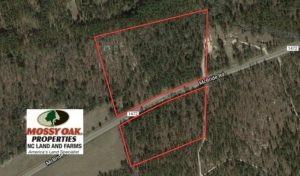 45 Acres of Hunting and Recreational Land For Sale In Wilson County NC! With plenty of timber, this property would make an excellent hunting tract or timber investment! 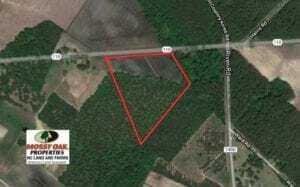 15.77 of Timber Land For Sale in Columbus County NC! 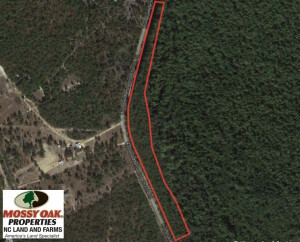 15.77 Acres of Mature Loblolly Pine with Whitetail Deer, Turkey and Small Game Hunting! With a cabin site, deeded access to a boat ramp, and the Black River only about 1,000 feet away, this property would be any avid outdoorsmen's dream! 1.21 Acres of Commercial Land in the Hub of Lake Gaston! 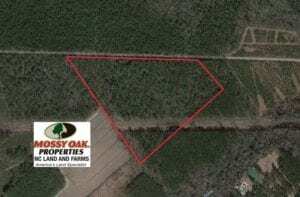 3 acres of Residential Hunting and Timber Land for Sale in Columbus County NC! 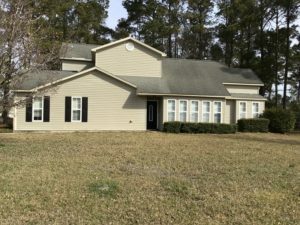 Located just 20 minutes from North Myrtle Beach, this would make a great dream home in the quiet country, and only a short distance to plenty of entertainment! 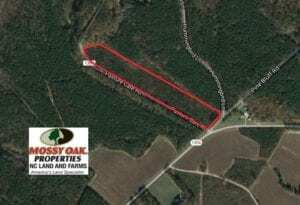 15.2 Acres of Residential Hunting and Timber Land For Sale in Columbus County NC! This conveniently located property has plenty of acres for hunting or a timber investment, while also having an area already cleared and ready for a dream home! With great amenities within the subdivision, access to 2 lakes, and a short drive to even more activities, this waterfront lot would make a great place for a dream home! 1.12 acres of Commercial Land in the Hub of Lake Gaston! UNDER CONTRACT! 13.79 Acres of Timber and Residential Land For Sale in Warren County NC! UNDER CONTRACT! 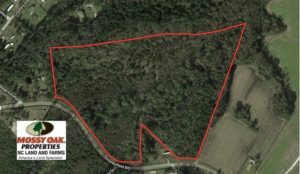 26.57 Acres of Hunting Land For Sale in Jones County NC! 11.34 Acres of Residential and Hunting Land For Sale in Lenoir County NC! Looking for a lot big enough for a home and a barn out back? This lot has a new survey and is waiting to make it a reality! 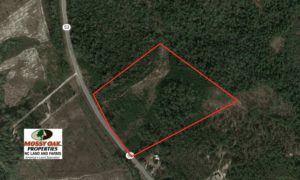 35 Acres of Hunting Land For Sale in Columbus County NC! With plenty of deer and a very affordable price, you can have your own hunting land for next season! 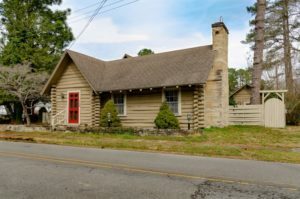 With longleaf and loblolly pine timber, home sites, and a great location, this property is perfect for your country home! 1.0 Acre of Commercial Land For Sale in Warren County NC! 1.0 Acre of Commercial Land in the Hub of Lake Gaston! 9 Acres of Farm and Hunting Land For Sale in Scotland County NC! With great agricultural soil types and plenty of wildlife, this is a premium farm located close to town that would make a great home site in the country! 20.03 Acres of Hunting Land For Sale in Warren County NC! 1.23 Acres of Residential Land for Sale in Cherokee County NC! If you've been looking for a place to build your dream home in Western Carolina then you need to take a look at this affordable lot! UNDER CONTRACT! 0.47 Acres of Residential Land For Sale in Warren County NC! 8 Acres of Hunting Land For Sale in Robeson County NC! 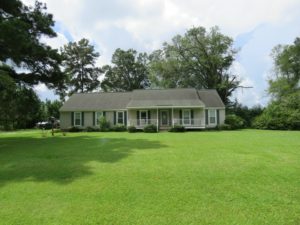 With a convenient location near Lumberton, this heavily wooded property would make a great country home site! Are you ready to build a home? This lot has already been surveyed and is waiting for you! Have you been looking for a perfect property in Eastern North Carolina? This lot has a new survey and is ready for you! 9.2 Acres of Hunting and Timber Land For Sale in Columbus County NC! This small, manageable tract provides great opportunity for a timber investment or hunting retreat! 9.5+/- Acres of Residential Land For Sale in Scotland County NC! This is a Private and Beautifully Treed Parcel with Several Home Site Possibilities. Ready to build a home in a perfect location? This lot has a new survey! Are you looking to build a home in a quiet location? This property has a new survey! 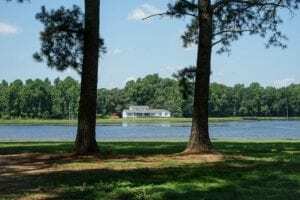 1.17 Acre Waterfront Lot for Sale in Hyde County NC! Have you been looking for an affordable property to build without breaking the bank? This lot has a new survey and is ready for your home! 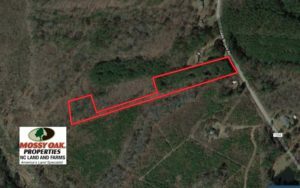 0.5 Acre Lot #49 Wysocking Bay for Sale in Hyde County NC! 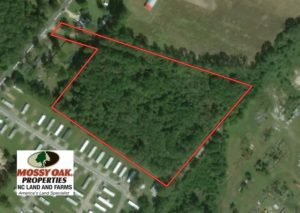 LOT #38 Wysocking Bay For Sale in Hyde County NC!